Thanks Crobinson! The bumper was wrapped first so I didn't get any pictures of it with the bumper still chrome and grille/headlights white. Nothing had to be removed/disassembled from the truck during install. The vinyl is holding up really well for the most part. The only issue I have had is near the front bowtie emblem. The vinyl is starting to separate/bubble from the chrome in the corners (see picture below). I have to get pretty close to even see it so it's not a big deal for me. If it starts to get worse, I will just remove the vinyl from that middle grille piece and put some fresh vinyl on. 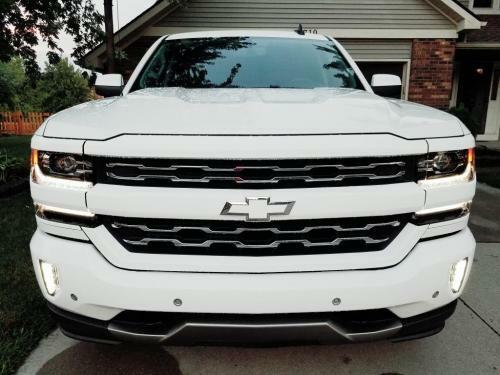 I had most of the chrome on my Summit White LTZ wrapped a couple years ago. Here are some photos: Front bumper, headlight covers, and grill Rear bumper Front bowtie Rear bowtie Mirrors I ordered a bunch of gloss white vinyl samples from MetroRestyling website. None of them were an exact color match but the Avery SW900 Supreme Wrapping Vinyl Film Gloss White was the closest. I ordered a 5ft x 12ft roll of it and ended up with a little left over. I also ordered a 1ft x 1ft piece of the white carbon fiber to wrap the chevy bowties. Installed the Go Rhino RB10's last night!